So, the question of the day is, how many times must I relearn the same lesson? The obvious answer seems to be, *many*. The last time I mentioned my mitten saga here, I was busy poring over books, knitting swatches and taking notes on gauge results & pattern calculations, all in preparation to knit myself some Latvian mittens, the final frontier in my patterned knitting adventures. I have small hands (5 1/2" wrist) and my challenge was trying to attain a gauge small enough to make wearable mittens that would still have that dense, multicolor patterning that takes my breath away. I cast on at the first opportunity and haven't looked back. I did learn quite a bit from my reading research, mostly focused on these five well-thumbed-through books. However, I've found that I'm so much more able to understand the fine points and suggestions in the books after I've started tackling a new multi-color knitting challenge. Information that completely escaped me on first reading definitely *clicks* once I've had some experience with what's being written about. So here's the lesson that I've learned again. If you've always wanted to try this type of patterned knitting, cast on and start a piece for the sheer fun of it. Without expectation of wearing it. Get that? Without expectation of wearing it. If your first effort turns out perfect, great! Go forth and multiply! (Or at least, make its mate.) For me however, the layers of expectation on such a first project are almost paralyzing...gauge, strand tension, color selection, pattern adaptation...all while hoping they'll fit properly! Sheesh. Two years ago, I just could not manage two-color knitting with such lightweight yarns as the recommended Satakieli and Finullgarn so I practiced with worsted weight Lamb's Pride and made a Christmas stocking. I finally attempted a mitten when the Selbuvotter book came out. On that piece, I got the hang of working with lighter yarn, but my gauge wasn't consistent. Feeling more confident after that, I then cast on the little bird mitten from the same book and not only maintained my gauge, but refined my ability to continue the pattern from mitten to thumb. Another leap forward. 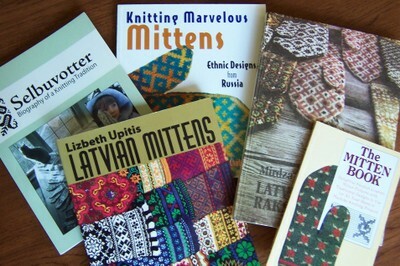 Now on to Latvian knitting, which I've been lusting over for years and can't seem to put down. Progress. Yes! Paralyzing layers of expectation...love that. What you said about the beautiful mitten knitting can cross over into so many other things. Keep leaping! I completely get this post. The extra bonus is that your mitten is so pretty! Must practice! You've made great strides...the mitten is so pretty!! i love the miitens i think they will be worth all the work you've put into them! those look cozy and warm, i like them. I'm still fearful of my one try that was a disaster but I think you make a good case for trying again. Okay, I have to admit this is the secret project I mentioned on my blog today. 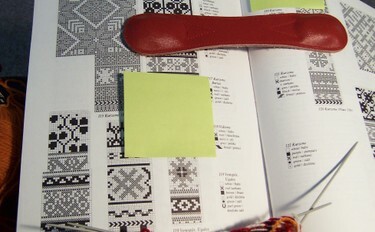 I have the Latvian mitten book, but don't think I'm ready for those, especially at such a fine gauge. I picked up Folk Mittens yesterday and I'm going to give the Selbu mitten a try. I was hoping to have them as a Christmas gift for Chloe. Would you recommend the other books you show there? I was thinking about getting Selbuvotter. Your mitten is fabulously beautiful. I hope to someday get to that point myself! Oh my, that does take my breath away and I love, love, love the colours you chose. So beautiful! I adore small gauge knitting and am looking forward seeing your finished mittens. How could I have missed that gorgeous Christmas Stocking you made in 2005? Wonderful! All these knitting posts everywhere make me want to cave and start knitting - instead of finishing my godson's quilt or even starting my MIL's quilt, due next FEB. Your mitten is so beautiful! I can't wait to see what comes next. Delish!!! Do I detect a hint of Cheddar???? Love the color combos...you never cease to inspire!!!!!! you are making such headway!! i can't wait to choose my colors for the pair i'm getting for christmas.., or i'll take those if they are too big for you AND molly! It's amazing when the light of good sense dawns. I think you're absolutely on the right track plunging into a project. No guts, no glory. And what you're showing looks pretty glorious to me. Thank you for this post. Mittens are a frontier I would like to explore at some point. It's good to be reminded to enjoy/learn from the process rather than focus on the product. Your mittens are gorgeous!! I have a good friend who lived in Latvia and knits. She has been searching for a copy of Mirdza Slava's book. Is that it in your photo? Can you give me any more info about the book? ISBN, full title, etc? Thanks!!! Surprinsinly to see that selbuvotter book in english. I grew up with selbuvotter on my hands, and learned to make them at the age of 12. Sorry I don't knit anymore - only quilting for me. I think you do wonderful knitting with a lot of colors. 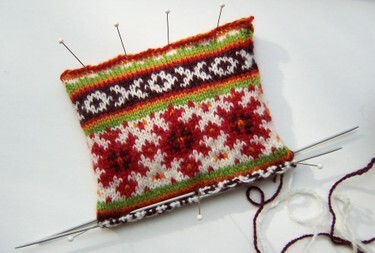 The Latvian mittens are just beautiful!